A collection of worm games and activities for kids. 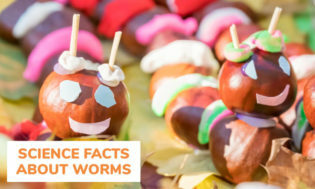 Enjoy worm crafts, worm themed snacks, worm themed science projects, and fun worm facts. 1. Cook spaghetti and add some oil to the water so that the noodles do not stick together. 2. Drain and place in a small container for the kids. 3. Set out 2-3 plates filled with different colors of tempera paint and some white paper. 4. Show children how to drag a piece of spaghetti through the paint to create interesting designs on the paper. Mix tempera to a consistency that won’t drip-but not too thick. If possible observe a live worm; discuss how worms crawl, wiggle squirm. Have children dip a string into a jar of tempera, keeping one end paint-free (Use clothes pin if necessary). Glue the pom-poms to one end of the clothespin. Glue two eyes to the end pom-pom. Glue the magnet strip on the back of the clothespin to make a magnet. Plastic grocery bags, preferably all the same color. Lids from a plastic bottle & buttons. 1. Wad up two grocery bags into a ball, and stuff into the toe of the stocking. Tie it off using a rubber band. 2. Press a second ball of plastic next to the first, and tie it off with another rubber band. 3. Repeat these steps until reaching the end of the stocking. 4. Glue a button inside of each lid to make “eyes”. 5. Glue the finished eyes to the toe of the nylon. Finish off your garden worm by gluing a yarn mouth into a friendly smile. 1. Glue the pompoms to the craft stick. 2. Glue eye to first pompom. 3. You can glue a small piece of red yarn for a mouth if you like. 4. Attach magnet to back. 7. PLAY DOUGH that LOOKS LIKE MUD! Bring 3 cups water and 3 tablespoons vegetable oil to a boil. While the mixture is heating, put 3 cups all purpose flour, 2 tablespoons cream of tarter, and 1 1/2 cups salt into a large bowl. Carefully mix the wet and dry together and knead until smooth. For the MUD additions, add brown tempera paint (either dry or liquid) and 2 or 3 Tablespoons of coffee grounds. It really looks like dirt! 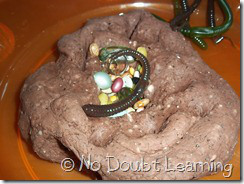 NOTE: I came across a site that used the above recipe to enhance a study unit — Wormy Wednesday–Worm Diet and Predators! The website is titled No doubt learning. I whipped up a batch of “MUD” play dough following the recipe from kidactivities.net. This play dough really does look like dirt and even incorporates coffee grounds (which worms eat!)! Using rubber fishing worms and a bag of “junk” (a collections of leftover shells, beads, beans, rocks, etc.) my girls were asked to show how a worm lives, what a worm eats, and how it protects itself from predators. What I found even more interesting though, is after I went into the kitchen to do dishes, the girls continued to play with their worms (that they endearingly named “Wormy” or “Wormy Worm Worm”) and their play paralleled what they had learned about worms. There were birds trying to attack from the top, moles from the bottom, the worms were sharing their organic food with each other, and continually sliding back into their burrows. The activity ended up being a great evaluation tool! You will need a 4″ x 4″ piece of cardboard. Cut the cardboard into a large apple shape. Next, cut out a small finger hole somewhere on the apple. Have child color the apple with a red crayon or marker. Children hold up the apple with one hand while they stick their pointer finger from the opposite hand into the worm hole and wiggle. Take the cup and cut out the bottom. Paint or color the cup brown; is the dirt from which your worm peers. Stick the worm through the cup and you have a fun worm puppet. 10. MAKE THIS SNAKE-PAINT IT BROWN and call it a WORM! Cut the paper towel roll into six sections of similar width. Paint the sections- decorating with glitter glu, and other details as desired. Once the paint is dry,apply googly eyes. This is a fun scavenger hunt idea! Give each child a plate with three gummy worms covered in whipped cream, and a cup. The first child to find the gummy worms with their mouths and get them into their cup is the winner! No Hands used!!! Be sure to have your camera ready-a good photo op! 1. Everyone in each line puts their left hand between their legs and the person behind grabs that hand with their right hand. 2. Then they run at a given signal to the other end of the playing area and back. 3. The first team to return ‘intact’ wins! 1. Have children stand in a straight line with their feet apart. 3. 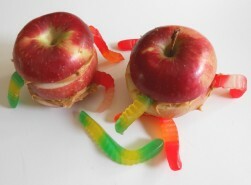 They crawl through the “apples” (children’s spread feet/legs). 4. When the player reaches the front of the apple line, the next person in line becomes the “worm”. 1. Stand with feet together, bend, and touch hands to the floor– just in front of your feet. 2. Walk your hands forward – without moving your feet up – until you can’t go any farther. 4. If some of the children cannot do this, they could always lie down on the floor and wiggle forward any way they can. Play some music to go with the movement!!! 17. PLAY ‘WORMS’ WITH A PARACHUTE! Place four to six skipping ropes on the chute. By shaking the chute, the children try to shake the ‘worms’ off. 18. WORM FARM- HOW WORMS WORK IN THE GARDEN!!! Cut the top off a plastic soda bottle, tape the edge. Put a few small pieces of banana peel in the middle for worm food. Continue with layers till top. Add worms. Tape the top back on or cover top with plastic wrap and tape. Either way, put in several air holes. Tape black construction paper around bottle, and leave for a day or 2 — try to do this on a Friday. When you take the paper off, you will see the tunnels the worms have made, and the layers will have shifted and mixed. Great way to show how worms work in the garden! 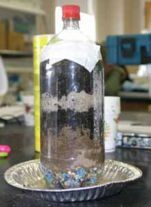 Make sure you check your bottle ecosystems every day; moisten the soil; add more moistened food to the top layer if necessary. You can also: 1.) Observe your ecosystems and record your observations. 2.) Draw a picture or take a digital photograph of your ecosystems. Go to bait and tackle store and buy bait worms. Dump them into two large tubs of dirt and let the children observe them as they dig. 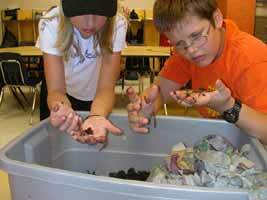 The children can use their hands to dig up the worms. If your children are young, have a variety of plastic birds at the table for pretend feeding. With the children, TAKE THE WORMS OUTSIDE and put them in the garden at the end of the day. Have a box of baby wipes available for hand washing. Carrots, lettuce, cabbage, celery, potato peelings, apple peelings, banana peels, orange rinds, and grapefruit. They also like cornmeal, oatmeal, coffee grounds in their filter, tea bags, and crushed eggshells. An earthworm can grow only so long. A well-fed adult will depend on what kind of worm it is, how many segments it has, how old it is and how well fed it is. An Lumbricus terrestris will be from 90-300 millimeters long. The largest earthworm ever found was in South Africa and measured 22 feet from its nose to the tip of its tail. Worms tunnel deeply in the soil and bring subsoil closer to the surface mixing it with the topsoil. Slime, a secretion of earthworms, contains nitrogen. Nitrogen is an important nutrient for plants. The sticky slime helps to hold clusters of soil particles together in formations called aggregates. Earthworms have the ability to replace or replicate lost segments. This ability varies greatly depending on the species of worm you have, the amount of damage to the worm and where it is cut. It may be easy for a worm to replace a lost tail, but may be very difficult or impossible to replace a lost head if things are not just right. The Australian Gippsland Earthworm grows to 12 feet long and can weigh 1-1/2 pounds. Worms are hermaphrodites. Each worm has both male and female organs. Worms mate by joining their clitella (swollen area near the head of a mature worm) and exchanging sperm. Then each worm forms an egg capsule in its clitellum. I usually don’t comment–although it’s a cute idea– I think it would look better as a caterpillar (Yellow frosting with yellow tinted coconut)–I’ll make that one next time! 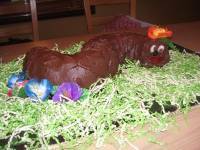 lol Barb) Photo by Kid Activities This idea is adapted from a ‘Caterpillar Cake’ in the Insects-Creepy Crawlie Theme. 1. Prepare cake mix as directed on box and bake in bunt pan. 2. Cut the cake in half and lay the two pieces together IN A CURVE–for the worm body body. Spread frosting on cooled cake. 3. Add facial details as desired. For eyes you could use several foods such as maraschino cherries, dot candy, banana circles, large spice drops, etc. This one has white jelly beans with a frosting dot in the center– and a leather fruit strip mouth. Make it green and you have a snake! Make two bunt cakes to make extra long. Combine apples, raisins, lemon juice, spices and sugar in a large baking dish. Cover and bake until apples are tender, about 30-45 minutes. Place in bowls and serve warm or chilled. 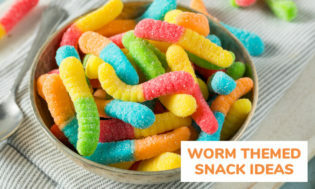 Garnish each one with a gummy worm. Try this twist of the traditional hot dog and bun. 1. Cut the hot dogs into thin slices and score the edges (about three cuts per slice). 2. Boil or microwave until the slices curl like wiggly worms. 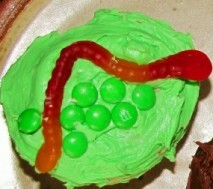 Serve three or four worms to a bun. For an extra-icky touch, add a few squiggles of ketchup. 1. Wash sprout (worms) with warm water. Using clean hands, mix one cup of the sprouts, the ground beef and the raw egg together in a bowl. Reserve the remaining srpouts until later. 2. Form burgers into six patties. Place in fry pan and srpinkle with salt and pepper. With an adult’s help, cook on medium heat until they are well browned underneath. Carefully turn the patties. Season again and cook until the second side is well browned. Fill clear plastic glasses with green Jello. When the Jello has almost set, add gummy worms, making sure a few of them are escaping over the rim of the glass. If desired, when the Jello has set, add a dollop of mud (chocolate pudding). Place Oreo cookies in a zip lock bag; have children break them up by banging the bag. Cover the bottom of cups with crumbled Oreos. Combined pudding mix and milk to make your pudding, pour into the cups–leaving 1/2 an inch of space at the top. Refrigerate pudding until set. Add crumbled Oreos to the top of each cup and garnish with a gummy worm. 1. Pour the milk into the mixing bowl and add the pudding mix. Beat with the wire whisk until well blended (about two minutes). Let pudding stand for five minutes. 2. Stir whipped topping and 1/2 of the crushed cookies into the pudding (very gently) with rubber scraper until mixture is all the same color. 3. Place about 1 tablespoon of the remaining crushed cookies into the bottom of each cup. 4. Fill cups about 3/4 full with pudding mixture. Top each cup with the rest of the crushed cookies. 5. 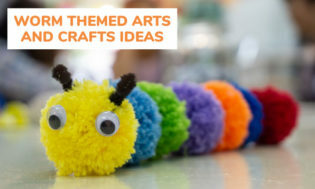 Add gummy worms and insects to decorate. Put cups into the refrigerator for about one hour to chill them. 1. Prepare instant chocolate and vanilla puddings separately, with two cupsof cold milk each , as directed on packages. Let stand for five minutes. 2. Gently stir 1/2 cup of cool whip into each bowl of pudding. Sprinkle onetablespoon of Oreo crumbs into bottom of plastic cups. Top each with 1/4 cupof vanilla pudding, 1 tablespoon Oreo crumbs and 1/4 cup chocolate pudding.Sprinkle evenly with remaining Oreo crumbs. Refrigerate at least one hour. 3. Insert one or more gummy worms a into each cup just beforeserving. Makes 8 Sand & Dirt Cups. You’ll need clear plastic cups, orange or green Jello, gummy worms and crumbled Oreo cookies. You can refrigerate the Jell-o right in the cups- place a gummy worm in the bottom of the cup before refrigerating. Kids love this party treat! Add a dollop of whipped cream if desired. 5. Add the remaining cake cubes. Cover with chocolate whipped cream. Sprinkle with chocolate cookie crumbs or chocolate chips. Add a few more gummy worms on top. 7. Scoop it out for guests with a brand new, washed gardening trough. 1. Find BOOKS ABOUT WORMS and what they do. 2. Encourage children to try CRAWLING like worms. 3. 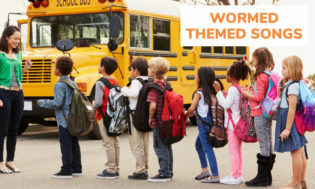 Help children MAKE UP A SONG about worms. 4. TOUCH a worm, how does it feel? 5. For fun-What do your kids think the proverb “The Early Bird Catches the Worm” means? 6. What do the kids think “Book Worm” means? There are two kinds of bookworms….. children and grownups that like to read are often called “bookworms”. It’s a good thing to be called a bookworm! A bookworm also refers to any type of insect which infests books—it’s the first definition you’re looking for! 7. Watch the 2006 Movie “How To Eat Fried Worms” (PG for mild bullying and some crude humor) Or get the book by Thomas Rockwell (At Amazon.com–really inexpensive used!) Be sure to discuss the aspects that make this film PG. 8. Take a walk after a rain and observe worms on the sidewalk. 2. Cut out the worms. With a craft punch, make a hole at the top. 3. Now personalize the worms! Make swirls, dots, and lines in different colors. Add a silly face, some words, or the name of a favorite book. 4. Flip the bookmark over and decorate the other side a whole new way! 5. Embellish the bookmark with ribbon, string, or yarn tied into the hole at the top. Add self-adhesive google eyes or other decorations, too. Reading is the next best thing to…. Enter a different world – read! Enjoy a book- get reading! Have you chosen a good book? Make friends with a book! I’m off to see the world – read! Here are some worms who are, oh, so sad. They’ve lost all the wiggles they once had. They wonder if you, just for today. Thank you for sharing your wiggles today. You’ll get them back when it’s time to play. I’ll tell you what we are going to do. Itsy, bitsy, fuzzy wuzzy worms. Oh how they wiggle and squirm. Did you ever see a wiggle worm. A wiggle worm, a wiggle worm? 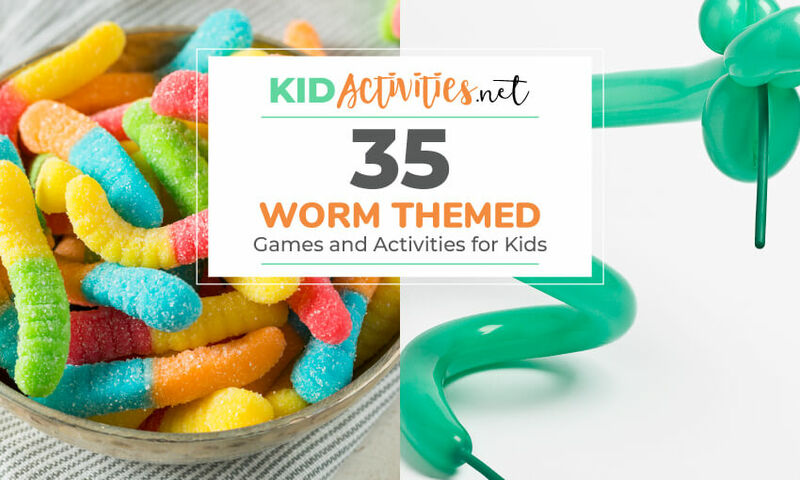 There you have it, some fun worm themed games and activities for kids. 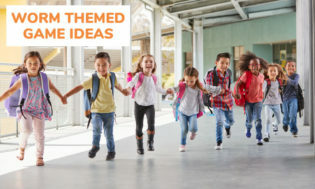 These ideas are great for creating a worm day theme for the classroom.